I had to have it. 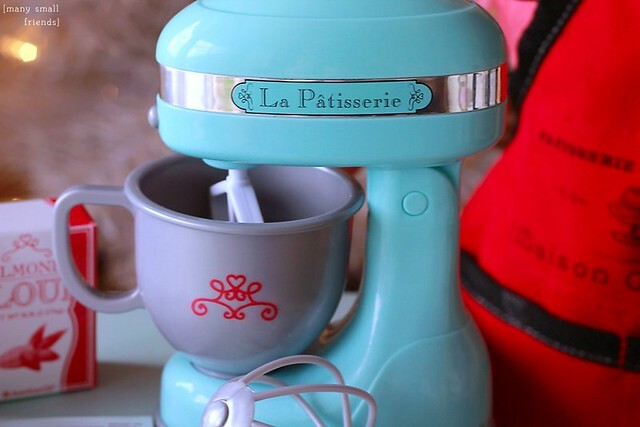 Because, you guys.. the mixer. American Girl has apparently found open access to my bank account via my obsession with dolly-size replicas of all the stuff I love, in all the colors I love. In honor of the 2015 Girl of the Year Paris theme: Le Sigh. Dear AG, if you want the rest of my money: Pyrex. Where was I? Oh yes, the Girl of the Year 2015 Grace Thomas and her Baking Set. Grace is sweet doll, but she’s not coming to live with me and the small friends, unless AG loses their everlovin’ minds again next fall and sells her for $68. Even though I’m not getting Grace, I’m certainly not above pilfering her collection. Grace’s storyline revolves around a trip to Paris and a love of baking, so American Girl has pulled out all the stops to load her down with seriously overpriced and yet irresistibly cute clothing and accessories. 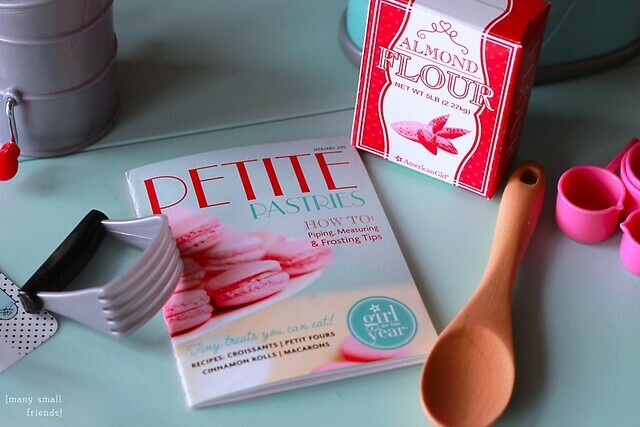 Bistros, bon bons, and berets.. oh my! I succumbed immediately (defined as: 12:01 a.m. CST on January 1) to the Baking Set. Thanks to early leaks, I was fully prepared to succumb, with debit card in hand, as the clock struck midnight. And then I waited patiently, as usual, for the mailman to deliver. An lo, it came to pass, that the items were delivered, and the human people and the small vinyl people were satisfied. Mostly. The set, as a whole, is undeniably adorable. Because wee, working stand mixer! But it’s very, very, very.. plastic. And most of it isn’t the good, heavy weight, substantial feeling plastic. It’s the cheap, thin, lots of visible mold markings, clinks-instead-of-clunks-when-you-tap-it plastic. Again… Le Sigh. The mixer is good plastic and the spoon is made of wood, but did I mention the retail price of this set is $68? It bears repeating at this point that in December, American Girl sold the Isabelle doll, her meet accessories, and her pet cat for the very same price: $68. Obviously that was a moment of corporate insanity, but still! A decent plastic mixer + a wooden spoon + a lot of cheap plastic stuffs and some additional paper stuffs probably isn’t worth $68 unless you REALLY love the mixer. Which I do, and which is why I succumbed. I made a review video if you’d like to see the mixer in action and get a few more details about each of the individual pieces included in the Baking Set. Overall, I’m not sorry I purchased this set. 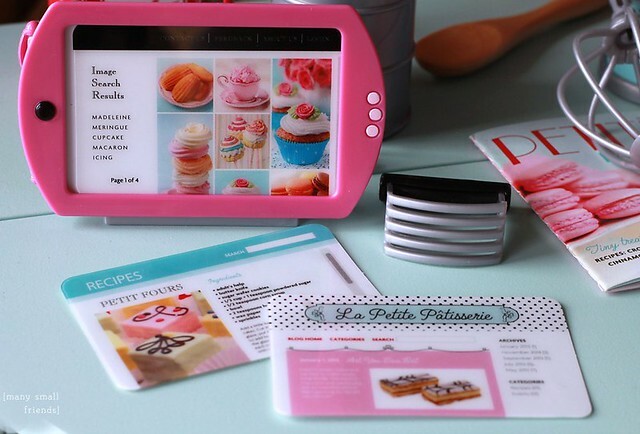 I received some gift cards for Christmas and I used a $10 off code so I’m telling myself I really only spent $58 on a plastic-yet-adorable stand mixer, tiny wooden spoon, and accompanying cheap plastic and paper accessories. 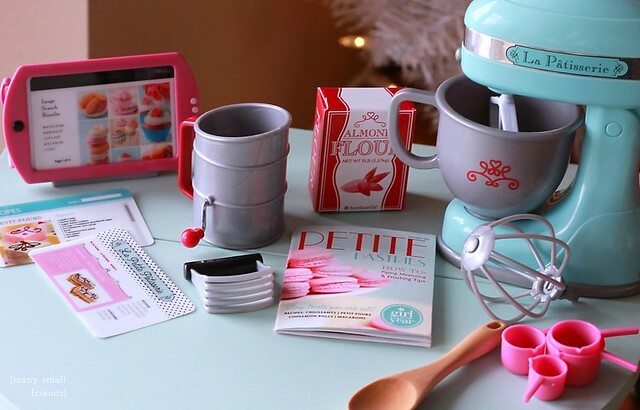 If I had to guess, the mixer will be one of those classic, highly sought after American Girl pieces after it retires, and a complete Baking Set with easily misplaced, tiny pieces, like the measuring cups and stylus will be nearly impossible to find. I wouldn’t want to be the poor soul trying to track the set down for a reasonable price on the secondary market in years to come. Yet, given the recent history of Girl of the Year megasales, I wouldn’t be shocked to see this set marked down next fall or early 2016. OR, it might just be popular enough to sell out by December and never go on sale. What do you think? Are you buying Girl of the Year merch at full price or waiting for sales? Is any of Grace’s collection a “Must Have” for you, or are you willing to take a chance on mark downs? This entry was posted in Doll Review, Doll Video and tagged American Girl Dolls, Doll Review, Doll Video, Girl of the Year.